In order to provide assistance to foreign companies in their foray into India, CROSSCOOP DELHI NCR / Gurgaon Cyber City “Business Center” has resident local partner who can offer support from market research to developing business strategies. In addition, multi-lingual staffs are present to deliver quality service. No deposit required, Minimum contract period: 1month, Office facility (furniture, phone, etc.) 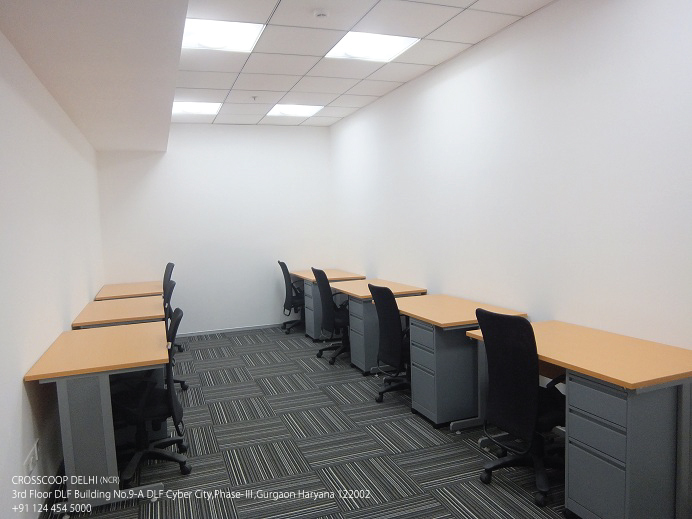 is ready for immediately use, Office space for 1 – 22 people, You are not required to pay any additional fee during contract period nor upon renewal!Please feel free and hurry to contact us if you have any interest. Just a few rooms are available now! Please Note : 10% discount for monthly rent fee is valid till end of this month. Crosscoop Always do this kind of promotional offer for the potential clients. We have Japanese-, Hindi-, English-speaking staff who can provide secretarial service, as well as make transport and accommodation arrangements on your behalf. 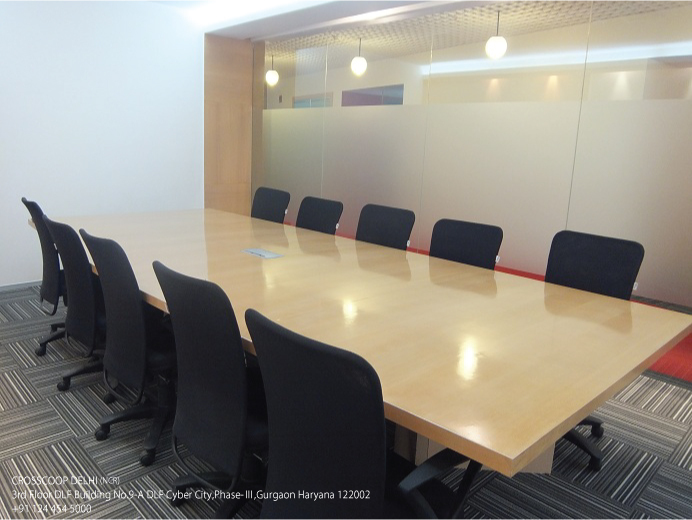 In addition, CROSSCOOP DELHI NCR / Gurgaon Cyber City “Business Center” has a cafeteria space (equipped with a simple kitchen, table and counter seats, etc) that can accommodate about 40-seats. Providing F&B-related companies, that intend to enter the India market, a specialized incubation space in the office to conduct test marketing. 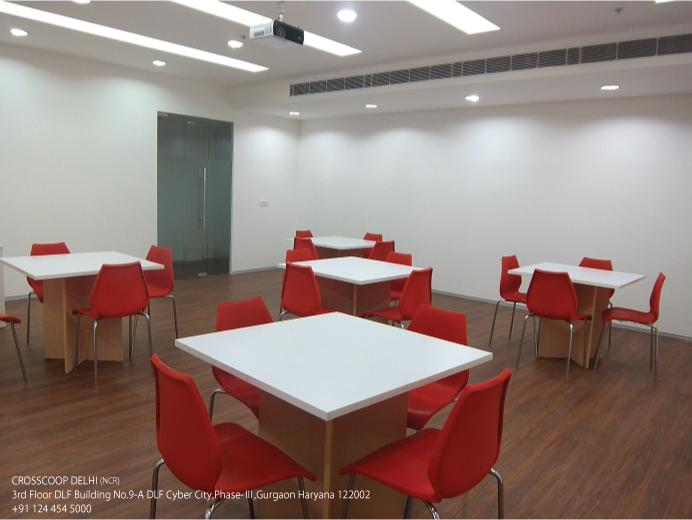 While supporting F&B companies’ foray into India, our other clients in the office also get to enjoy delectable cuisines.The cafeteria space doubles up as a function room where clients may rent to use for private events, training workshops, seminars, etc. 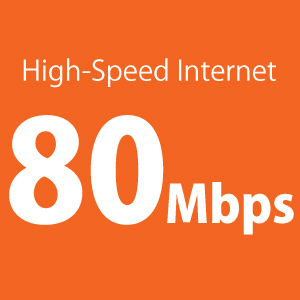 80Mbps India’s Fastest Broadband Speed ! Internet speed in India is commonly between 3 – 5Mbps. 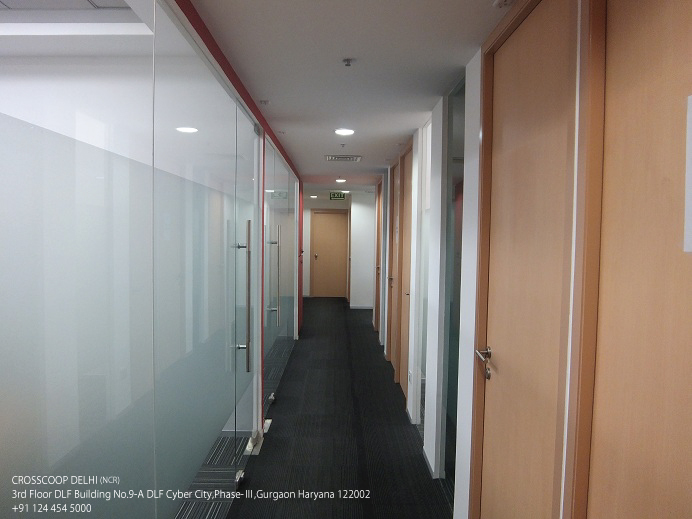 However, CROSSCOOP DELHI NCR / Gurgaon Cyber City “Business Center” is equipped with 80Mbps high-speed broadband internet, creating a stress-free working environment. File-sharing with overseas headquarters via VPN server can also be supported. 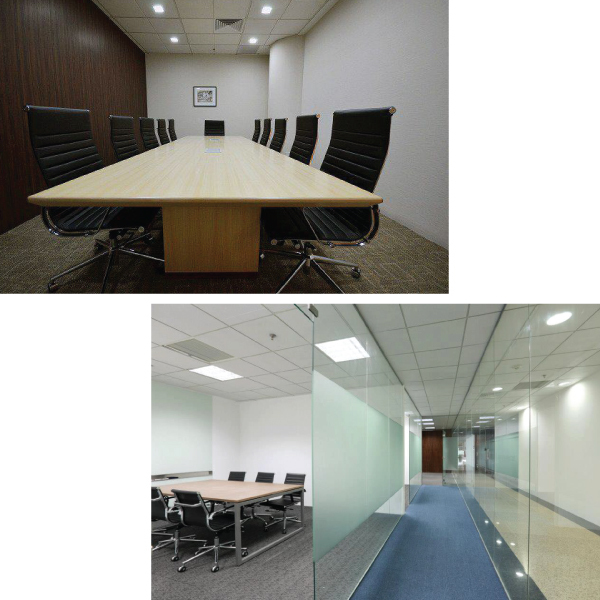 Private office sizes vary from 10-60 square meters(1-22pax) and layout can be freely adjusted to suit your needs. 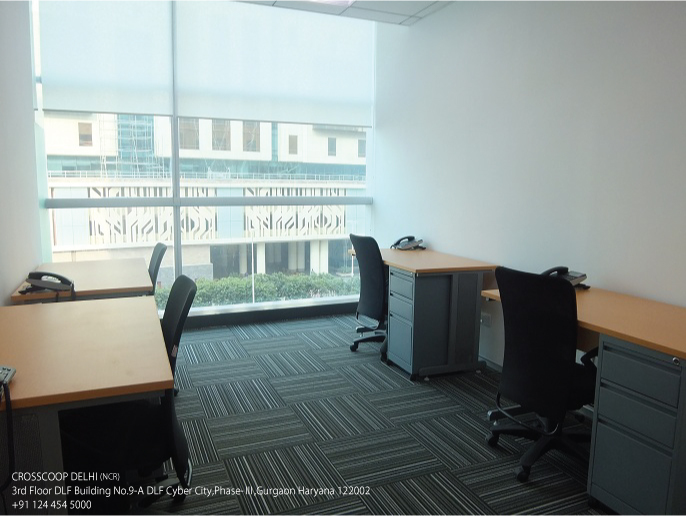 Offices are fully-furnished and equipped with Internet and Telephone, you may begin operations as soon as you move in with your PC. For same number of users, prices differ between private rooms on window-side and on corridor-side. Shared-Office is where users share an open-concept office. Fixed-Seat users are entitled to choose a preferred desk space which comes with a phone and a lockable cabinet whilst FA (Free- Address) Seat users may use any vacant desk space. Maximum of 2 users are allowed to share a Fixed-Seat whilst an FA-Seat is only limited to 1 user. Meeting Room facilities, Web Conferencing System, Cafeteria Rental, Phone services, Internet, Fax, Secretarial service, Security Lockers, Market Research, Market Expansion & Business advisory service, Real Estate (Residential/Commercial) service, Recruitment, Business-matching, Corporate Secretarial service, Tax & Accounting service, Visa Application, etc. # Refundable deposit(2 month) and Security Card issuance fee (Rs 3,500 per user) are required. # Minimum 1 month contract available. # Contract is not in the form of a lease agreement but that of a service agreement. # Fees are NOT applicable for Contract renewal, Room Change or Restoration (Charges apply for repairs if room is damaged). # In the event of contract renewal, fees may vary depending on the real estate market rate. # 14% Service Tax + Education Cess applies. 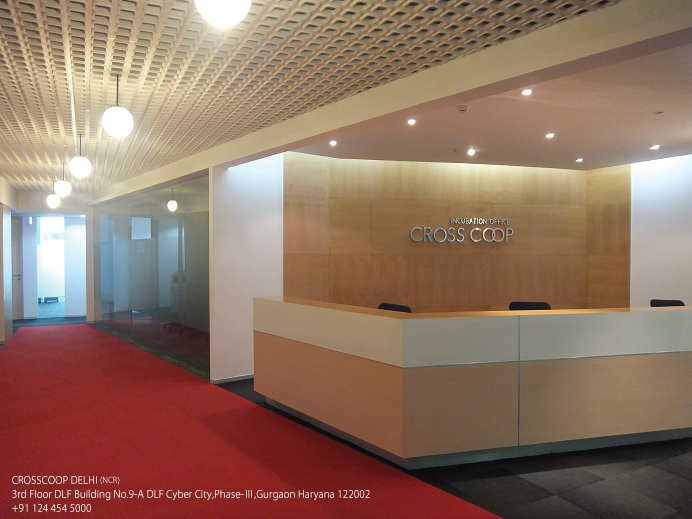 CROSSCOOP DELHI NCR / Gurgaon Cyber city “Business Center” is located in DLF Cyber City, in the heart of the emerging Gurgaon city, near national capital Delhi, and clients may register their company at this address. Within the area, there are many leading foreign companies, upscale restaurants, apartments, shopping malls, etc. Also, with the Delhi Metro, there is easy access to the capital city, New Delhi, and to the Indira Gandhi Airport. 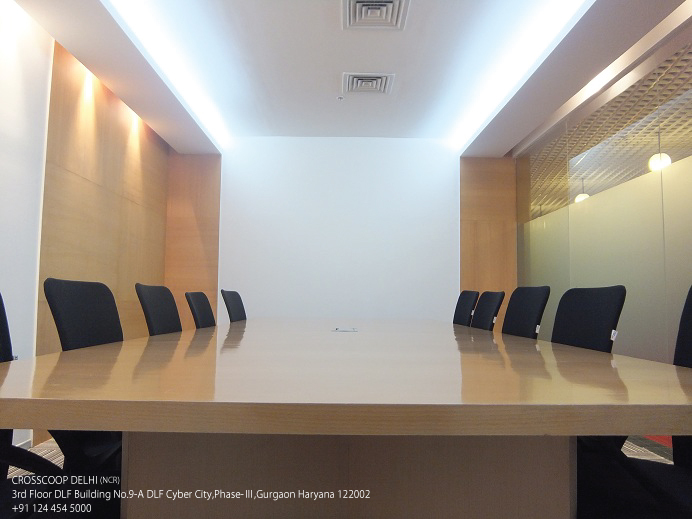 Office viewing is available from 10am to 5pm on weekdays in CROSSCOOP DELHI NCR / Gurgaon Cyber City “Business Center” . For enquiries or more information, please do not hesitate to contact us at +91 124 454 5000 or send request from contact form below. Copyright(c) 2012- SOCIALWIRE CO.,LTD. All Rights Reserved.